One of the great slot games, Where’s the Gold is powered by Aristocrat, which is the largest manufacturers of gaming solutions. 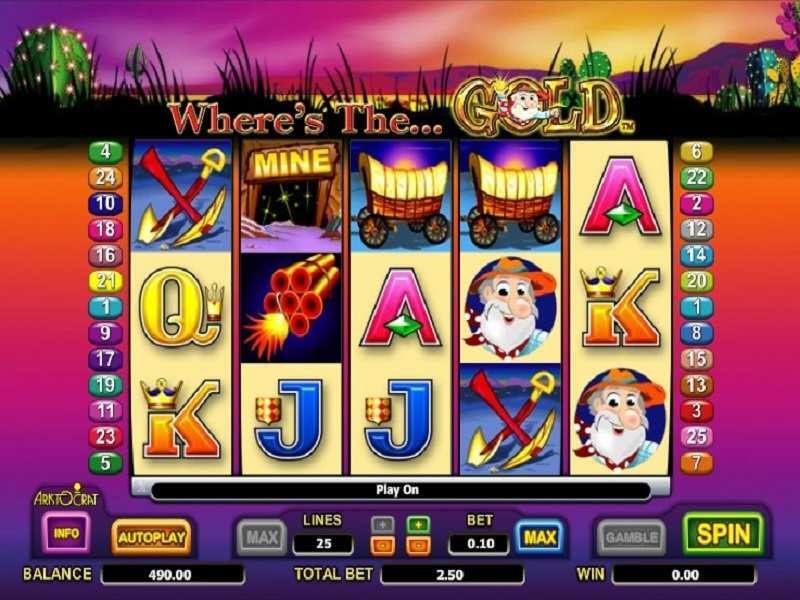 As the slot name goes, it is based on the ‘search for gold’ theme. Where’s is the Gold slots come with 5 reels and 25 paylines. The slot does not include too many flashy items. It is set against an orange, pink and blue background. In-line with the theme, there is an old miner who is trying his luck by digging for gold, gold mines, bundles of dynamite and the usual card symbols. How to Play Where’s the Gold Slot? The player takes up the role of a gold digger. So accordingly, the symbols are allocated to the slot – an axe, a gold miner, a live gold mine, dynamites, a cart to carry the gold. The dynamite symbol is the scatter of the game. When you land with 3 or more of these symbols, you are entitled to a bonus The gold symbol is the wild. The bonus consists of 10 free spins in addition to three gold wild symbols. When the feature is activated, it shows a character from which you have to make a selection, which is then displayed as a spotlight. The number of free spins you win will be denoted by the number of nuggets presented in the window right below the spotlight. The feature can be re-activated. This too helps you to increase your money. You can place your odds on a card’s color or suit. For guessing the color right, you get 2x multiplier and for guessing the suit correctly, you get a 4x multiplier. Wild: The gold symbol is the wild. It can replace all symbols but the scatter. Scatter: The dynamite symbol is the scatter of the game. When you land with 3 or more of these symbols, you are entitled to a bonus The scatter is capable of replacing all icons. Axe: The axe helps you in digging up 300 coins for 5 of a kind. Gold miner: This is the symbol giving the highest payout. A gold miner gives you 1000 coins for 5 of a kind. Live gold mine: The mine improves your bank roll by giving you 500 coins if you land with 5 of them in a row. Cart: A cart to carry back the gold gives 300 coins for 5 symbols in a row. The betting range starts from $0.01 for a line to a maximum of $4 per line. The maximum bet hovers at $100 for the game. The winning amount is decent but not very frequent. The RTP of the slot stands at 94.92%. The one thing that will help you win is getting 3+1 scatter symbols anywhere on the reels. You can play free Where’s the Gold casino slot machine in any trusted online sites. As of now, the Where’s the Gold online version is available for the players in UK, and other few selected countries for free. It is not available for players in US and Canada. If you want to play the slot for real money online, it is a little difficult for players outside UK. The game requires no download and is instantly available for play. The bonus feature appeals to a lot of gambling enthusiasts and in fact, Where’s the Gold is considered as one of the best slot games from Aristocrat. 0 responses to "Where’s The Gold Slot"
1 How to Play Where’s the Gold Slot?